Micah is another minor prophet who prophesied during the chaotic era of the kings before the destruction of Israel and Judah. Like most other prophets, he prophesied largely about the judgement of God and the destruction of Israel and Judah, without leaving out the idea of restoration of God’s people to God. Most interestingly, however, is the fact that he does not leave out the important task of prophesying about the Messiah as well. Yet today’s study will put Micah’s prophesies entirely to a side, as we focus on his teaching. Well technically it’s God’s teaching that he merely retold, and some would consider it a prophecy, perhaps – but I’m totally going to regard this verse as a piece of teaching and dissect it accordingly. He has shown you, O mortal, what is good – Do you know what is good? 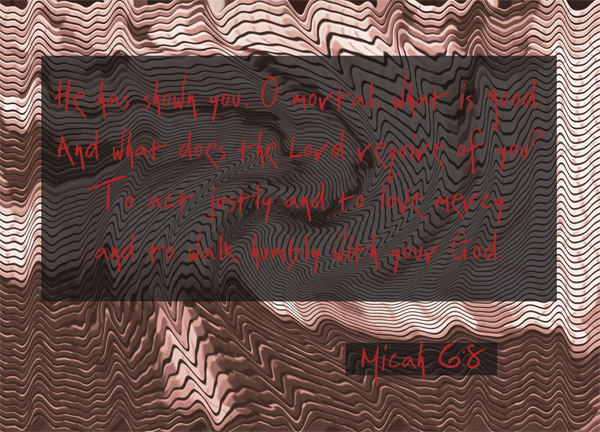 If I was living in the times of Micah, that would be the one question that I’ll ask – what exactly is this ‘good’? Back then the people did not have the luxury of the Bible, although they still had their scriptures and they had the luxury of prophets who must have certainly prophesied and preached, again and again, about what is good. We only have the Bible, so we’ve got to turn back to it. Psalm 34:8 – Taste and see that the Lord is good – the Lord has already shown us what is good. He himself is good. But we need to experience him, we need to taste him to be able to see his goodness. Often we look in the wrong places to find goodness. Look no further – it’s right there, God is good – his ways are good [Psalm 18:30], his words are good [Heb 6:5]. And what does the Lord require of you? – The Lord puts his requirements out very bluntly this time – it’s so straightforward that it seem odd that it actually came from the Old Testament, and even from a prophet’s book. There are 3 requirements listed in this verse, and while these are probably not exhaustive, there are little lists like this in several parts of the Bible – And now, Israel, what does the Lord your God ask of you but to fear the Lord your God, to walk in obedience to him, to love him, to serve the Lord your God with all your heart and with all your soul, and to observe the Lord’s commands and decrees that I am giving you today for your own good [Deu 10:12-13]? – It’s more or less the same, isn’t it? 1. To act justly – The term ‘act‘ basically means in everything that we do, in every action that we make. With the righteousness of God, treat everybody justly. Do not repay anyone evil for evil. Be careful to do what is right in the eyes of everyone [Romans 12:17]. Give each man his due, in accordance to the commands of God, and cause no harm to a man or his possessions. That is our duty – to act justly to men, as mentioned; to act justly to God, in our keeping of his precepts and to express our love and gratitude to him; to act justly to ourselves, and not deprive our own souls from the fellowship of the Church and our intimacy of God. 2. to love mercy – our God is a merciful God – in fact, he desires mercy and not sacrifice [Hosea 6:6]. Mercy to whom? To the weaker, the pitiful, the poor, those who need help, those who need patience. To those who have done wrong against you, your enemies, your accusers. What is loving mercy? It basically means something like hating to hate, no? love being kind. Love being generous. Love being gracious. Our God is a merciful God. Think of all the times he has forgiven his people for their sins against him, which often lasted for generations! Think of the amazing mercy that must be behind the act of sending his only son to die on the cross for us! 3. to walk humbly with your God – three things of note here. Firstly, the idea that this journey of faith is a walk. Life is a walk. Paul prefers to call it a race, but it’s pretty much the same idea. Have you ever heard of the poem, Footprints in the Sand? Pretty much the same idea too. Our walk with God speaks a lot about our spiritual health. People like Enoch [Gen 5:24], Noah [Gen 6:9] and Abraham [Gen 17:1] were said to have walked with God. Note how each of these three men were said to have walked faithfully with the Lord. Secondly – humility. This walk with God requires humility. It takes humility to not walk on your own terms, it requires submission not to walk towards your own will. Thirdly, and most importantly, this process must be done with God – and nobody else. You cannot walk alone. You cannot depend on others. Without God walking beside you, there is just no point. If you earn the whole world but do not have God with you, there’s just no point in it, is there – What good is it for someone to gain the whole world, and yet lose or forfeit their very self? [Luke 9:25]. I like this verse a lot. It simplifies the things we need to do into three simple steps for us – well, each of these three branches out to mean a lot of things, but at the very end of the day, when I check myself and I ask myself if I have done what is good in the eyes of the Lord, I just need to ask myself these three questions in whatever I do. Did I feel that I’ve acted justly? Was I more ready to show mercy than wrath? Was I walking humbly with God throughout this? These are the Lord’s requirements – and it is important for us to check ourselves against them. Often we may fail, especially if we do not check ourselves against them. But by checking against the Lord’s requirements, we are compelled to raise ourselves up a level higher, and a level higher, and a level higher each time, until we finally meet them.